Look deep into its soul. I had just managed to choke down an entire $12 “Monumental Hangover” omelet -- a feat almost as daunting and dubious as its name suggests -- when the guy sitting next to me suddenly lost his lunch. Blech! Hard to say whether it was the sheer sight of my monstrous meal that caused his stomach to churn, or other factors (presumably, given his slurred speech, we can count a healthy dose of alcohol among them). But watching me cram in every bite of that ginormous mass of chunky mushrooms, burnt bacon strips, starchy potato wedges, gobs of gooey cheddar and Monterey Jack cheese, diced onions and tomatoes, and enough eggs (a total of eight, according to a manager) to give my cardiologist a heart attack by proxy couldn’t have helped matters. It was certifiably the biggest omelet of my life, approaching "Man v. Food" territory, and it required a healthy dose of Sriracha to get it all down. I felt like a contestant on the competitive eating circuit, breathlessly polishing off the last bite to the sound of retching nearby. Say this about the service at Serendipity 3 (3150 M St. N.W. ): Your food order may not always arrive in a timely fashion, but the staff is incredibly quick with the accident cleanup. Within minutes, the splattered mess was mopped up, the offending customer hauled off in a cab, and the horrified matrons sitting to the poor fellow’s left had returned to picking at their creamy crab artichoke dip, albeit somewhat reluctantly. One sick patron does not define a restaurant. I bring up the gnarly incident for a reason. The setting is so ostentatious, adorned with Tiffany-style lampshades and other precious tchotchkes; the crowd is so boisterous, full of chattering tourists and tweens; the portions are so prodigious, from the Chicken “Not So” Little soup to the four-person treasure chest of cakes and ice creams; and the prices are so inflated, ranging from an $11 hotdog to a $1,000 sundae, that you may find the entire experience a bit, well, nauseating. I’d heard multiple reports from friends about their Serendipity exploits, all of whom relayed a similar storyline of slogging through second-rate meals in pursuit of sugary bliss. 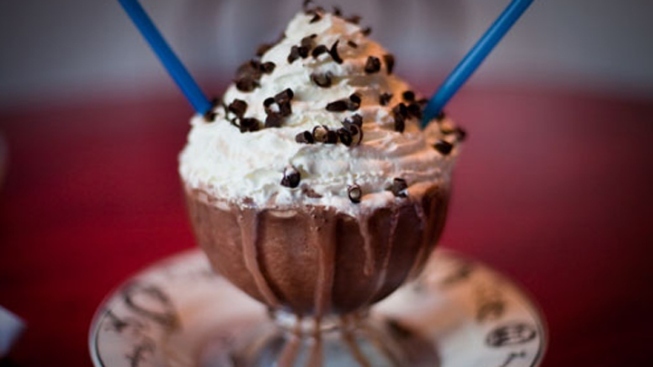 That frothy mixture of mousse and ice cream, topped with fluffy whip, sprinkled with chocolate shavings and served with multiple Smurfy blue straws for sharing, is the same thing that actors John Cusack and Kate Beckinsale slurped together on screen in the 2001 romantic comedy "Serendipity," which of course takes its name from the eatery. The original location in New York, where that memorable scene takes place, predates the movie by several decades. Pop artist Andy Warhol was among the early Manhattan celebrities to embrace the place. But you can credit the latter-day chick flick for helping to popularize the brand and expand its reach, first to Boca Raton, Fla., followed by Caesar’s Palace in Las Vegas and now the ever frou-frou M Street NW in Georgetown. There are only so many places in the world that are prissy enough to handle a restaurant of this particular caliber, and Serendipity has infiltrated the top three. The “frrrozen” drink remains the restaurant’s star attraction. Looking around the kitschy D.C. dining room, you see tourists posing for photos, their lips pursed on opposing straws. The preliminary portion of the meal is just an enabler: You order the lackluster taco salad in order to justify indulging in the sickeningly sweet not-so-hot chocolate, served in a variety of flavors ranging from peanut butter to “mocccachino,” or the deep-fried Oreo sundae, which I personally found more interesting. Determined to better rationalize the staggering jolt to my own blood sugar, I set out see if any one of the some 60 non-dessert items listed on Serendipity’s menu is worth the trip by itself. At a place named for “the art of finding the pleasantly unexpected by chance or sagacity,” I figured there must be something sublime to discover. But, after multiple visits, I’m still searching. Naturally, the proprietors of this whimsical sweet-tooth palace, Rodrigo Garcia and Britt Swan, got into the high-end sundae racket by way of the D.C. nightlife scene, where the quality of food has long taken a back seat to higher priorities such as plentiful booze and beautiful people. Garcia operates Georgetown’sL2 Lounge. Swan runs Rhino Bar & Pumphouse. Their backgrounds undoubtedly explain the expansive list of cocktails, beers, and wines available to the erstwhile ice cream enthusiast. To be fair, the pair is by no means attempting to challenge Michel Richard’s Citronelle for the neighborhood’s fine-dining crown. Far from it. “Think Cheesecake Factory,” is how several people affiliated with the restaurant have described its ambitions. I’m not sure which entity is more insulted by that comparison. The venue opened over Memorial Day weekend with an executive chef, Jason Ferrell, poached from the Las Vegas location, who introduced some new dishes exclusive to D.C. Many sported locally themed names, including the “President’s lobster pasta” and pan-seared Virginia striped bass. Ferrell split after just two weeks, leaving a restaurant manager in charge of both the kitchen and the front of the house. But his creations remain. It’s hard to fathom Barack Obama ever partaking of the so-called presidential pasta, despite his apparent penchant for burgers and other artery-clogging fare. The chunks of sinewy lobster meat and pappardelle noodles come drowned in a deep, cheesy brown butter broth that recalls the ultra-soupy servings at Pasta Mia in Adams Morgan. The locally sourced striped bass, meanwhile, arrives overcooked and under-sauced, served with three densely battered rock shrimp and a side of under-seasoned steamed broccoli. Serendipity 3 is the umpteenth New York transplant to take root in D.C. recently, along with BLT Steak, P.J. Clarke’s, Carmine’s, Shake Shack and Luke’s Lobster, among others. But it is perhaps the only one where employees will say, “The food is better than the one in New York,” and really mean it. The Kobe beef sliders came without a hint of pink, a state unbecoming of such a venerated brand of meat. The house’s “glorious” buns were quite ordinary, tasting rather like an unsalted pretzel. The accompanying bacon aioli could have been the sliders’ saving grace, but there wasn’t nearly enough of it to compensate. The macaroni and cheese, meanwhile, reminded me of the Velveeta variety in both its taste and bright yellow-orange hue, with the added touch of some scant crusty breadcrumbs on top. The menu describes the dish as “drizzled with the essence of aromatic truffles.” But it must be quite faint because I couldn’t detect it. Neither could my dining companion. Maybe that’s the surprise I was looking for: a disappearing fungal odor. How serendipitous! Eatery tips? Food pursuits? Send suggestions to hungry@washingtoncitypaper.com. Just Desserts: At Serendipity 3, Your Entrée Is An Enormous Afterthought was originally published by Washington City Paper on Aug. 3, 2011.